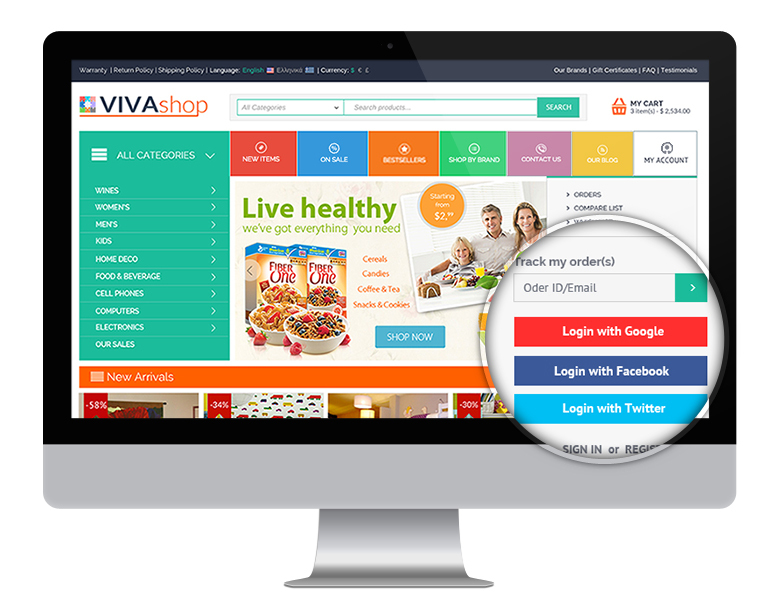 We have created VIVAShop CS-Cart theme simply to make the difference, being ready to impress any client of yours, having a unique and clean responsive design and unique features, ready for CS-Cart and CS-Cart Multivendor. It is definitely the best theme on the market and most probably the last CS-Cart theme you'll ever buy. 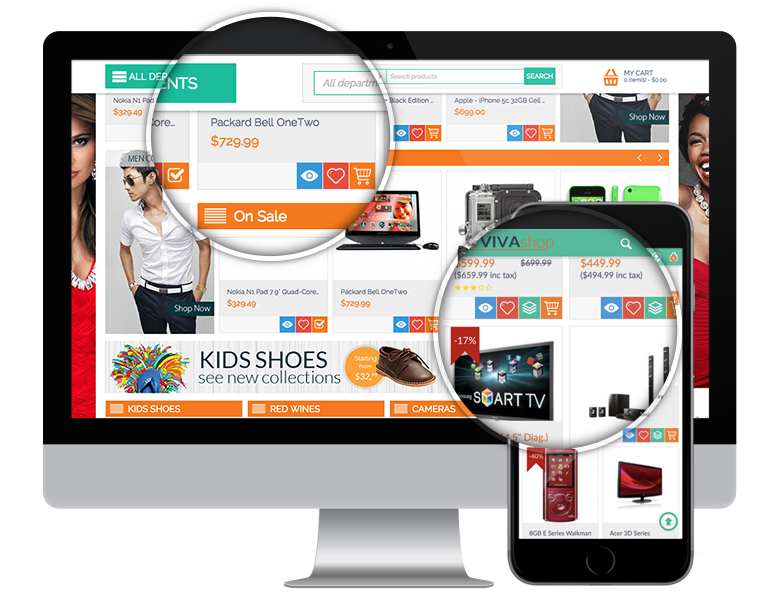 You can use VIVAshop theme for absolutely any type of store selling products like clothes, wines, watches, sunglasses, footwear, lingerie, home stuff, electronics, cell phones, multimedia or technical items, products for kids, gifts, or anything else. It comes with 5 already created styles, so you may choose the one which perfectly fits your needs, or you can customize any of them, or simply create your own style, as VIVAshop has a complete recoloring power - you can recolor anything! 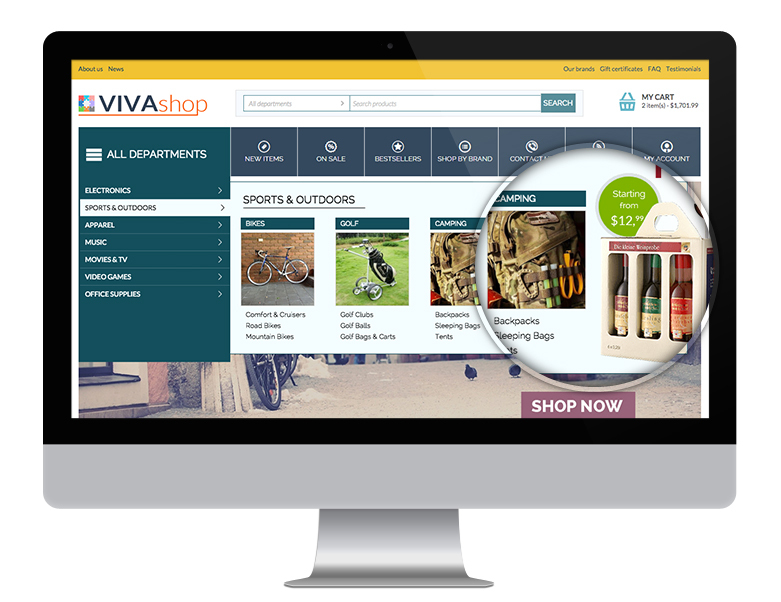 Get VIVAshop today and set your store apart from your competition. As always, we'll also be here to support you through the impeccable support services we offer. 5.One year of FREE updates. Imagination will be your only limit. There will be unlimited colors available for you to customize your store according to your own best needs and wishes. 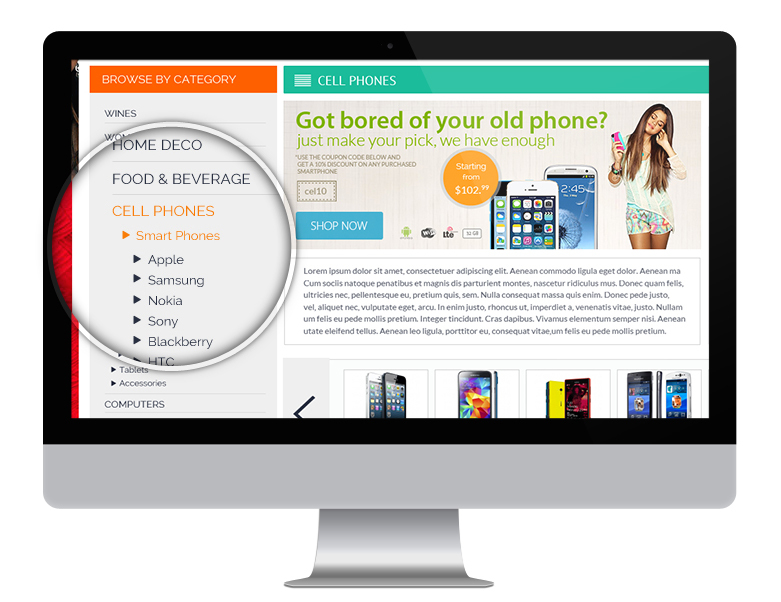 Practically, with no programming knowledge, you can change your store look any time you want. We have added 26 more customizing options to the CS-Cart default customization panel. You can simply recolor any single part of the theme, thus always come with a new design in order to impress your clients and keep them coming back and buy again from your online shop. Also, you should know that statistically, you have 3 seconds to make a new user stay on your site after landed on any page of your site. The way your store looks is also a part of the things needed to make them stay. VIVAshop comes with 5 ready-to-go professional styles, virtually created to fit any type of store. 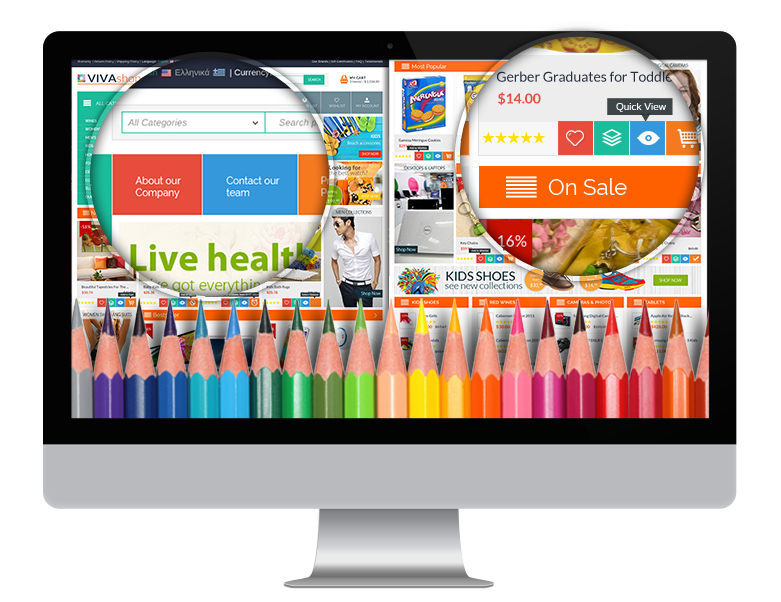 One single click and your store gets a complete new design. We have added these styles to VIVAshop in order to save your time dedicated to store customization, thus having more time to concentrate on your business itself. All of these styles can be fully or partially edited to even better fit your needs. Also, we have locked them in the theme customization panel, so in case you bring custom changes to any of the 5 styles, they will be saved under your own style, and, if you ever want to return to the original 5 styles, you can always activate them back. To see these presets, please go on the theme demo and click on the "Theme Editor" button on the middle lets side. Once the customization panel opens, browse between styles in the "Styles" dropdown menu. The hover delay is one of the most important features in any themes using vertical category menus, and extremely useful for user experience. Hover delay prevents the menu expanded window to instantly disappear when user moves the mouse from a level one category to a category inside the Mega Menu which is, for example, in the lower side of the expanded menu. For example, if you already hovered over a level one category and you want to select a subcategory which is in the lower part of the already expanded menu window, you inevitably mouse over another level one category which is just below the category you just opened. The menu delay will still keep your current category expended window opened for a few moments, and the other category does not open immediately when hover over it (which it is very annoying because you loose the desired opened category window). This way you can easily navigate further to the expanded window subcategories. 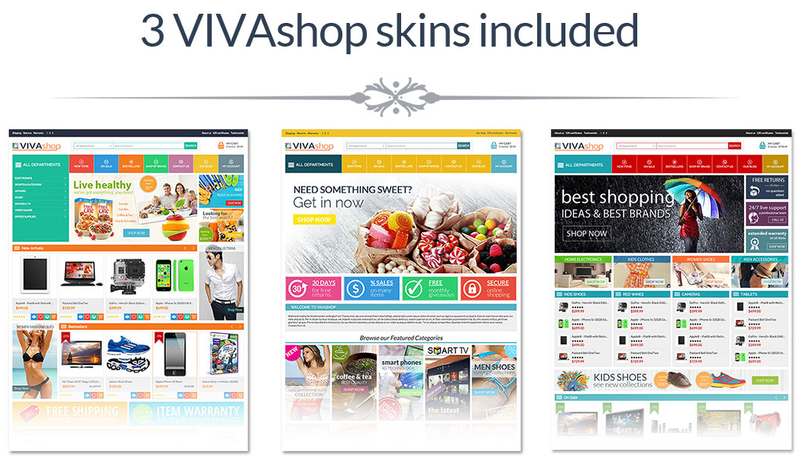 Inside of the VIVAshop theme package you'll find a Mega Menu Image addon created especially for our theme. Once you easily install it, you'll be able to add any image to the Mega Menu, this way giving an even better look to your store. You can assign any link to this image, promoting certain store categories, products or anything else. The image addon enables several options so you'll be able to position your image anywhere you want in the menu, you may even take it outside of the menu, as well as setting the menu window width and height. Also, in the customizing panel we have included options to customize your Mega Menu colors, so you can add your own colors to the Mega Menu background, expanded window background, decorative background, and links (both on active and on mouseover). Besides the images that can be added to the Mega Menu (using the included Mega Menu Images addon), all of your second level category thumbnail images will be automatically shown in the Mega Menu once you assign images to the respective subcategories, thus improving your store design quality and user experience. You may easily enable/disable these thumbnails with one click. We all know how important the content is for search engines. 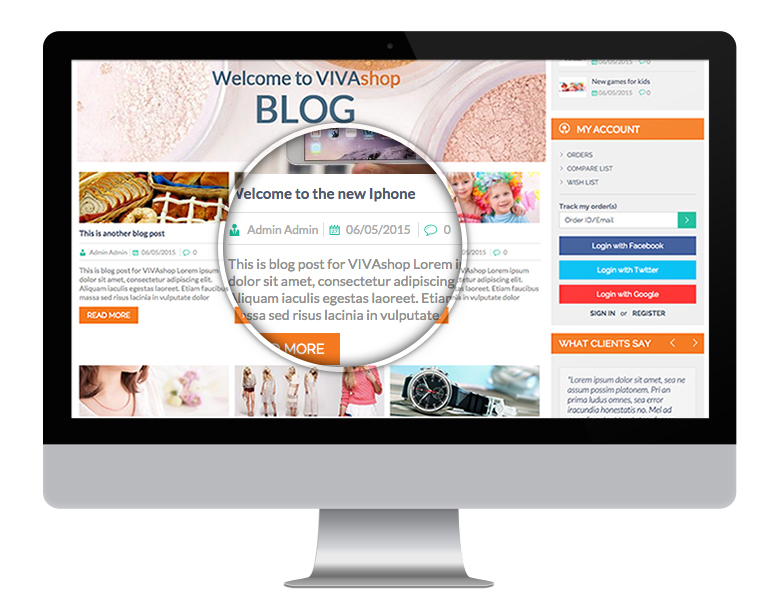 Create SEO content and keep your clients informed through the clean and nicely designed VIVAshop blog pages. Add images, videos, text or any kind of HTML content. Also, let your users comment on your posts. 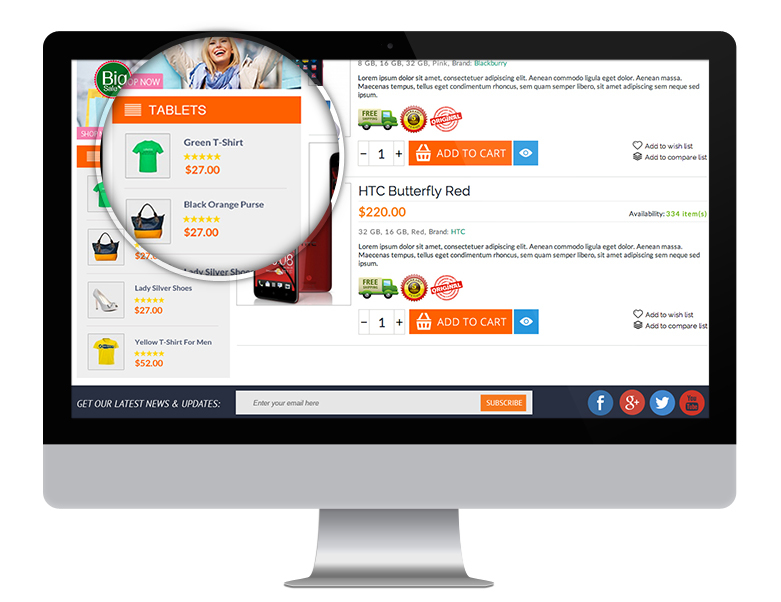 Your customes need a more exact search to get the desired results faster. 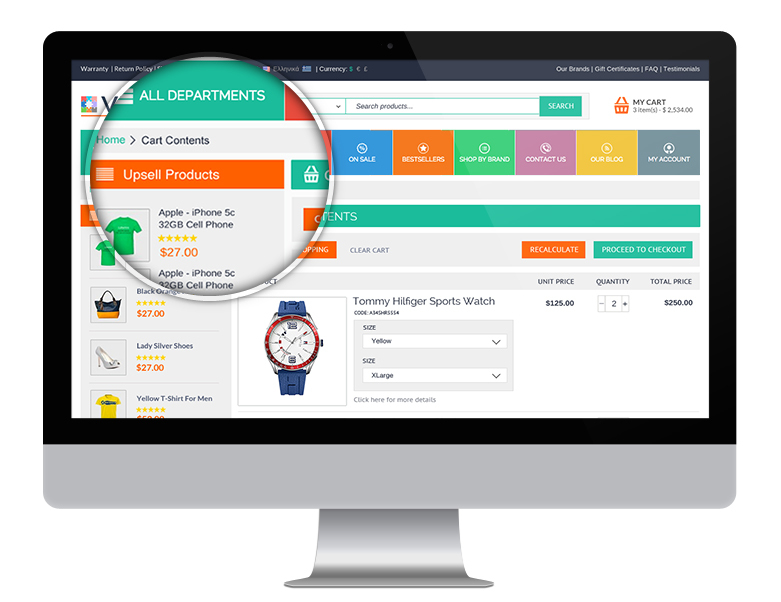 For this reason we have created an addon which allows your users to do a more exact search by looking for the desired products in a certain category. 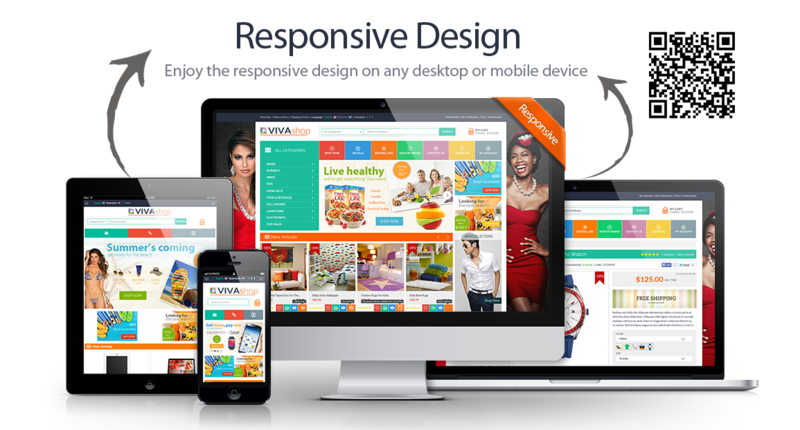 This addon comes together with VIVAshop theme and can easily be installed with a few clicks. 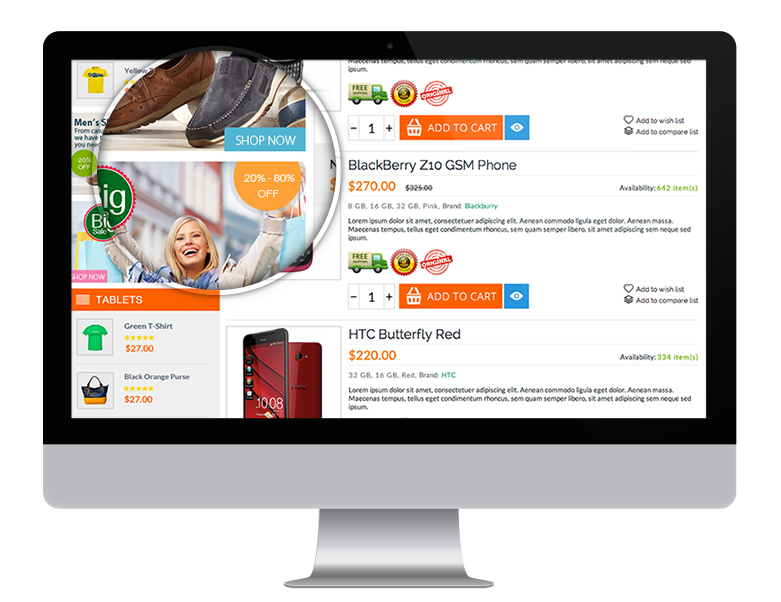 Using the Advanced Category Search, customers will save time and therefore increase their experience on your online store. This is a very useful feature especially for stores running in several languages. We all know that same word meanings have different lengths in different languages. In this case, if you run a store in multiple languages, it's a high probability that design could get broken. To make sure you do not have this issue, we have created Dynamic Grid Buttons. On the product grid listing, the “Add to Cart" button changes according to the product status: Button changes if a product is out of stock, if it has options or if the product will be available on the certain date. Also, these buttons have Tooltips on mouseover so whatever language is used, design will not be broken. As an example, please see the “New Arrivals" product slider from our demo site homepage. Nowadays, almost everybody has a social account and probably anybody who buys products online. Social Login/Register Buttons will allow your customers or potential customers to save even more time by signing in or register on your store easier and faster by simply using their social accounts, thus increasing again the user experience. The Social Login/Register Buttons are included anywhere there is a sign in form on the theme, so your users will always have them handy once they decide to login or register on your store. Store loading time is one of the most important aspects of any site, be it a simple site, store or a multistore with tens of thousands of products and many lots of users. Regardless of the store size, it needs to load fast and therefore do all the necessary optimizations towards this. One of the optimization which helps reaching this goal is the Image lazy Loader. Through this feature, all store images are loaded only when needed, meaning they will be displayed as you scroll down the page. By implementing this feature, we have reduced the number of on-load server requests by almost 75% and homepage size by almost 65% making the theme load even faster. Of course, loading speed depends on other factors as well, like server connection, image sizes you use, etc, so results may vary on your site. The animations included in the theme will simply make you different. Theme comes with 3 animation types. There are 4 image autoscroller animations when user hovers over a product image that has multiple images, 5 Product image animations for carousel scroll, handling the animation style of product images in all product scrollers when the customer scrolls through the site. You can simply select your desired animations out of the above two animation types, by simply choosing them from the theme customizing panel. There are also 5 block animations that you can assign to ANY block on the site from your admin panel. The special special product pages will list all of the “New items" you just brought into your store, your “Bestselling" products or list all of your “On sale" products. Links to those pages have been added in the Main Menu, so that your buyers would always have hem handy. 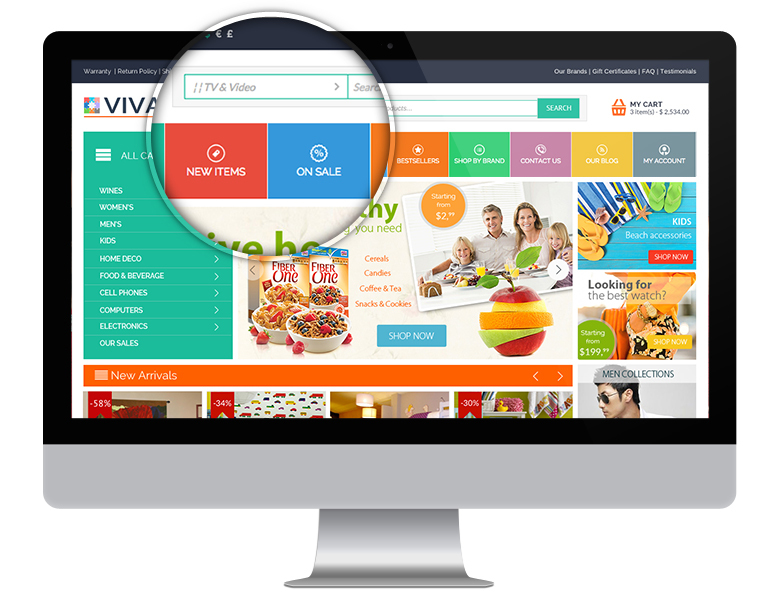 The main horizontal menu designed in the earlier versions of VIVAshop was changed into a new style, all menu buttons now include icons and you may change the color of each button individually. However, the old menu style was kept as well, thus you'll have 2 horizontal main menu styles to choose from. While your visitors browse your website and scroll down on a page, main menu always remains on top of the window on both Desktop and Mobile versions. It gives more ease in navigation as users always have the main menu handy when they need to rapidly access a different category inside of your store. 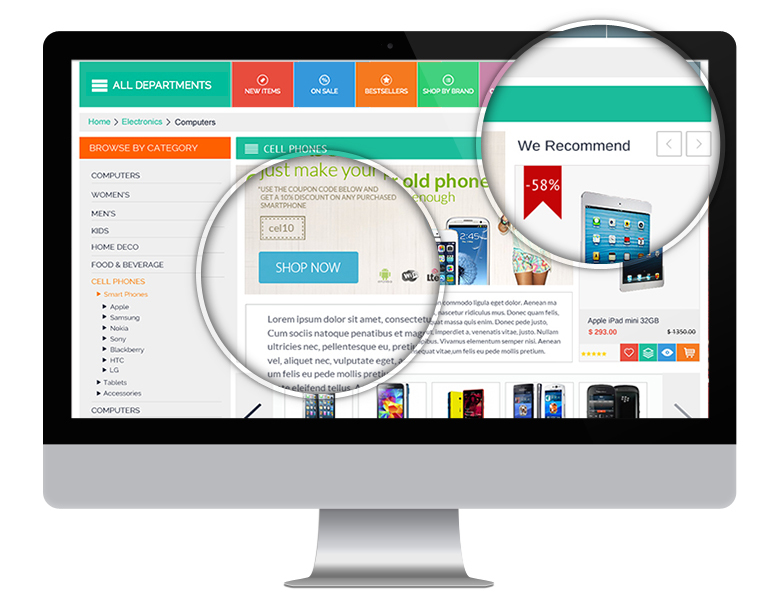 This feature is very useful especially for long store pages listing many products. For desktop versions the Advanced Sticky Menu comes in 2 forms: One contains the All Departments menu, the Search bar and the Cart, and the other keeps all of your Main Horizontal Menu. You can use any of the two Sticky Menu forms on either of the two VIVAshop skins and also may choose to disable/enable the Advanced Sticky Menu. For mobile versions Advanced Sticky Menu will keep on the top of the page 4 important buttons: Categories, Search, My Account and My Cart, as well as the store logo in case you want to come back to the homepage. The Cookie Law is a piece of privacy legislation that requires websites to get consent from visitors to store or retrieve any information on a computer, smartphone or tablet. We have integrated a cookie law pop-up which includes your chosen text, as well as an icon and a button which inherit colors form your store, thus nicely integrating into your store coloring. Also, you have the option to easily enable/disable this pop-up at any given time from the theme editor. 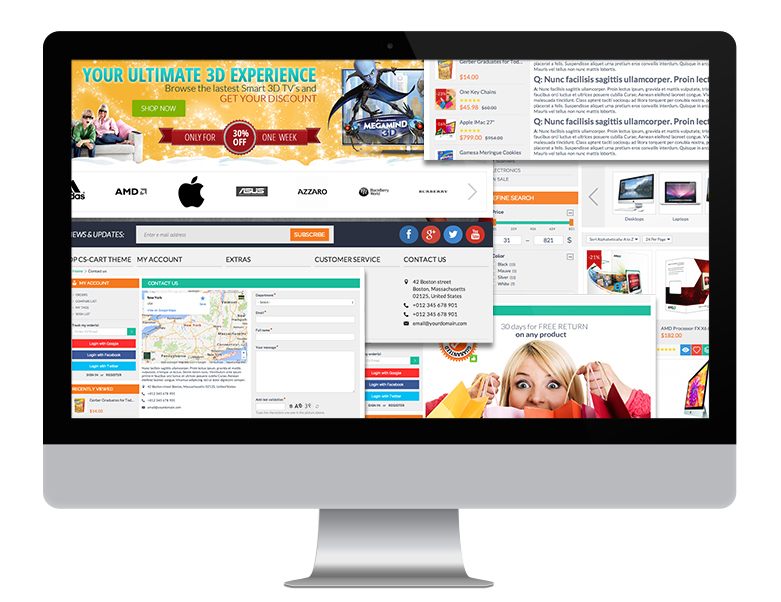 Easy navigation is an important thing when it comes to user experience on your store. On category pages we have created a navigation block so that your users could always have all store categories handy and easily switch and browse through them. Also, in case users land on other pages like "Adbout us" page for example, they can still access categories by simply going to the Mega Menu and select the desired category they are interested in. 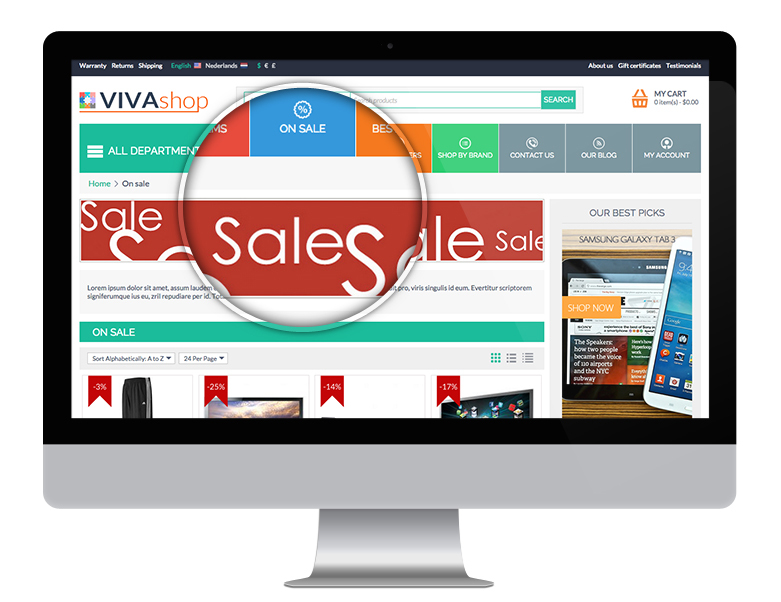 Emphasize or promote important products, categories, special discounts, shipping info, warranty info or just anything else, by using the homepage silder and banner blocks created in VIVAshop theme. In the main slider you may include as many slides as you want. Please note that our theme comes with sample demo banners. You may start by adding these sample banners, just to get the feeling and change them once you create your own banners. Demo banners included in the package will help you have a quick start. The homepage contains several product sliders and product blocks created for you to show certain desired product types. Product sliders can be set to automatically or manually slide. You can include in these sliders and blocks any products you want, like bestsellers, top rated, most popular, newest items, or simply manually add any products of your choice. At any rate, our suggestion is to include here any products that you consider a potential customer should concentrate more on, or promote special store items. On category pages you can include an horizontal banner, detailed category description. You can easily include here any details regarding the products listed on your site in a certain category. You may include any HTML code, text, images, video, links, etc..., or you may choose to not include any description. Also, you can easily customize your category description text by choosing font colors, text styles, text, video and images alignment. Product slider we created is designed for you to promote any products on any category page. Make your user's navigation even easier by adding subcategories images to the subcategores slider we implemented in VIVAshop. If a category has subcategories, then on your category page, will automatically appear the slider subcategories displaying all subcategories belonging to that category. All you need to do is to easily assign images to the respective subcategories and give your customers a visual idea about the subcategories types. Also, if a category has many subcategories, then slider arrows will be activated and user will be alble to easily browse through them and select the desired ones. On product page and category page sidebar we have created a banner slider, designed for you to promote absolutely anything, as you'll be able to link these banners to any page of, or ouside of your store. You may choose to disable these banners for certain categories or pages. Please note that theme package contains sample sidebar banners, so you may use it at first just to test them out and change them with your own banners latter on. On category and product pages we have added two more banner blocks, for you to gain even more space for promoting or emphasizing anyhing within your store. Similar to Sidebar Banner Sliders, you may choose to disable these two small banners for certain categories or pages. Also, you'll find demo banners included in the theme package, for you to play around until you finally upload your own banners. 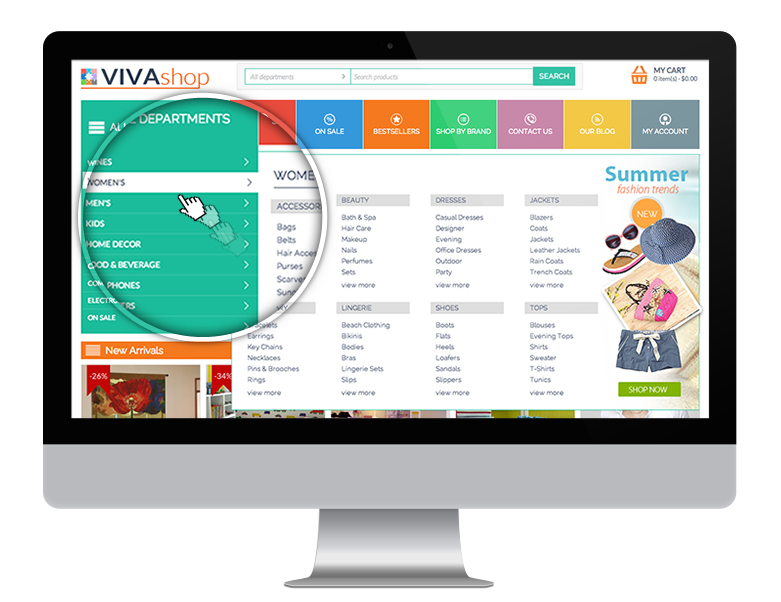 Many pages from VIVAshop theme contain a sidebar small product listings. You can add here any products of your choice like bestsellers, top rated, newest, most popular, recently viewed, or just simply manually add any products of your choice. You can also set the number of products shown, so you may have more products shown in some categories and less products in others, whatever you wish. Note that in these listings we have implemented product ratings, which when clicked, user is forwarded directly to the reviews tab of the respective product page. On any product page you'll find a custom quick info block created fo you to add some short and important info related to a product, like shipping, warranty, returns, phone number of your sales department. You may however choose to add your own text here and add your own icons. Info dispayed here is meant to immeditely grab customer's attention so make sure you include something short and important. 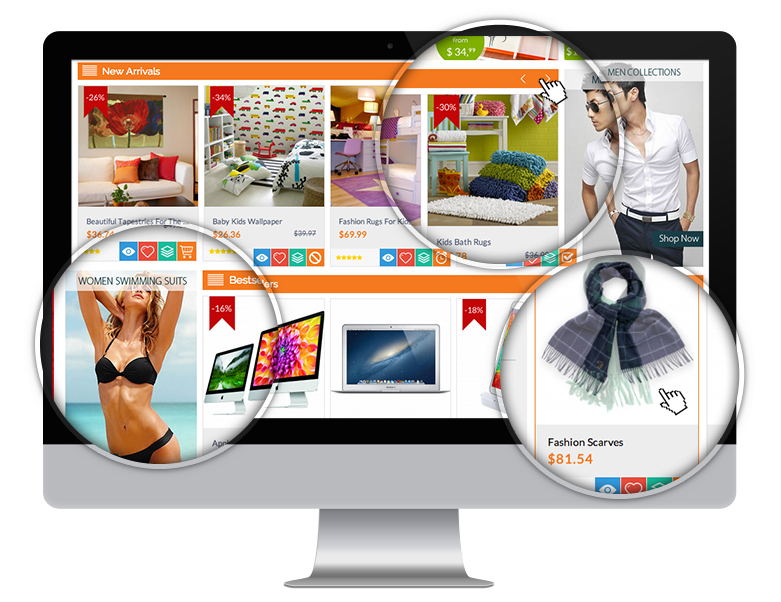 Product page contains a Multiscroller with three custom tabs with product sliders. 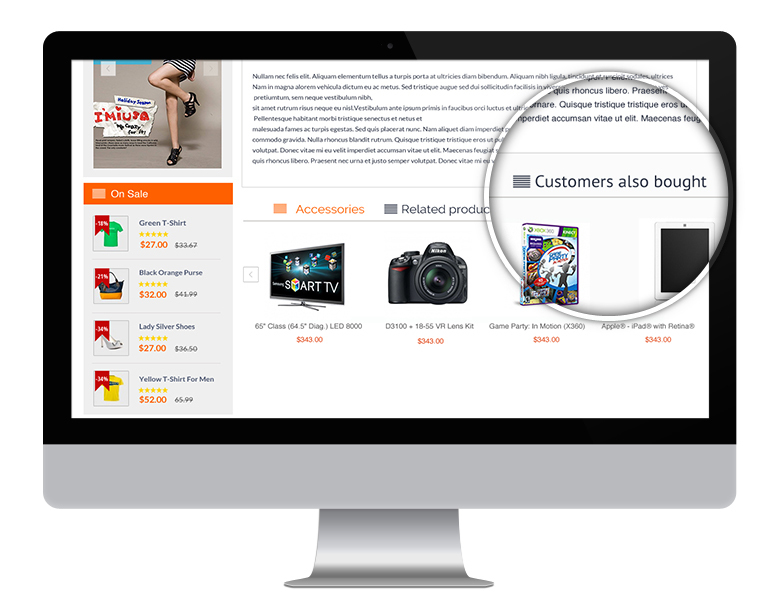 You can include any products here like bestsellers, top rated, most popular, recently viewed or manually add any, but most probably you'll want to add any items related to the current viewed item, or upsell products. 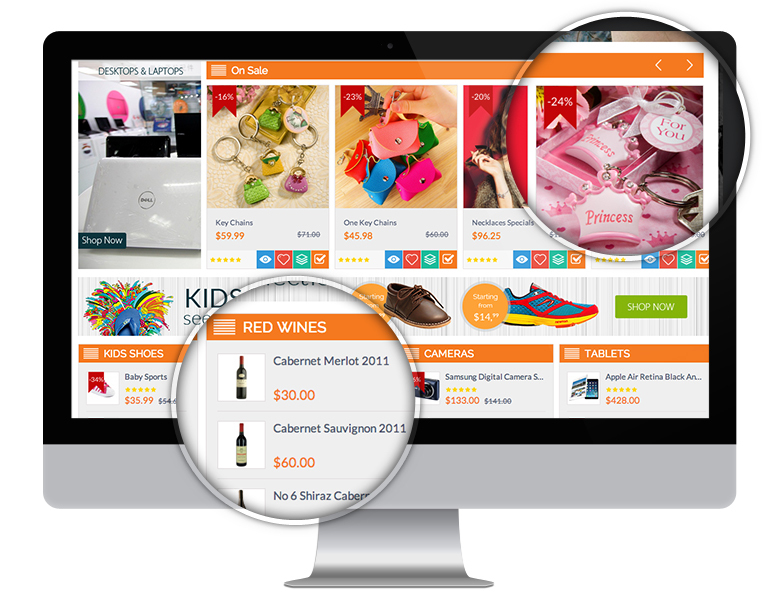 It can be items from the same category or products belonging to other categories. The good thing is that you may place this kind of multi-scrollers wherever you want on your store. In our documentation you'll find all the necessary details on how to easily create them without any coding knowledge. You can include in these Multiscroller as many products as you want. 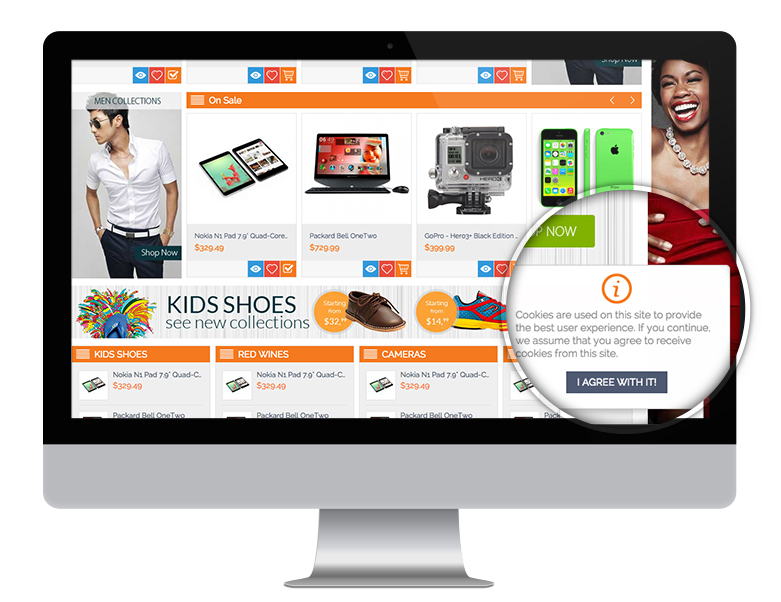 Customers can easily browse through them by simply dragging them or click on the slider arrows. Make your clients buy more by including any products in the special products block we have created and included in the Cart Content page. Here you can add any products and watever products you want. You may probably want to add here some items bearing some important discounts or some promo items, or simply add some products you know your clients will not be able to refuse. This is the best theme available right now on CS cart. PERIOD. The theme comes with a very detailed set of instructions. If you follow them carefully, you will achieve the best design and results. I keep getting surprised by the level of attention these guys put into every detail of this theme. The design is superb and well-thought out. Looks great on mobile, tablet, and desktop. I am so obsessive compulsive when it comes to design and I really could not find any fault in this theme. I also want to give a special shoutout to Energo for going the extra mile for me. I had them do a custom development for the theme and they did it exactly as I imagined and more! Thank you so much guys. For those deciding whether or not to buy this theme, just DO IT NOW. The theme is excelent, high qualty and a lot of beatiful details. In the other hand the tech support is great, they are the best, they help you in any matter you require. Thank you for your comments, however, we feel the need to add our response, as your review does not reflect the quality of our product. Firstly, compatibility of other third party add-ons with our theme is not our job. What third party add-ons you install is strictly your own concern, decision and responsibility. This is clearly stated on our website, and you have agreed with it before and at the time of purchase. We have never ever guaranteed any compatibility with any third party add-ons or any third party custom modifications. 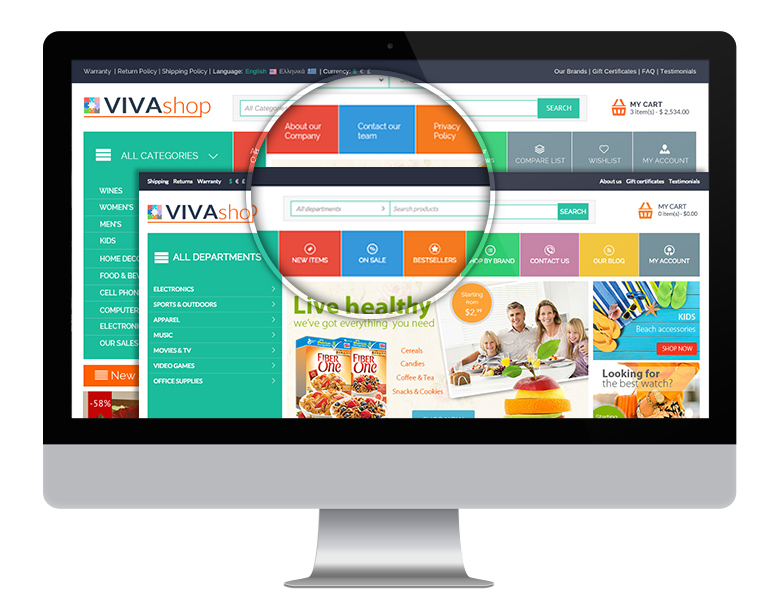 We have only guaranteed compatibility with CS-Cart/Multi-Vendor software and with all of the default CS-Cart/Multi-Vendor add-ons, that our VIVAshop theme was built for. Secondly, there are 1,440 add-ons available on the CS-Cart Marketplace here alone. Stating that 90% of the add-ons are not compatible with our theme means that you have already purchased/downloaded and tested 1,296 of those 1,440 add-ons. As both of you and us know, and as anyone can guess, you have not done so. Therefore, your review is a false statement, which does not reflect the reality, and is only meant to mislead readers, simply because we have not agreed in offering free work by fixing your own wrong custom code modifications/custom add-ons, after we had already investigated and detected the cause of your issues free of charge, as well as provided free reports all the time. 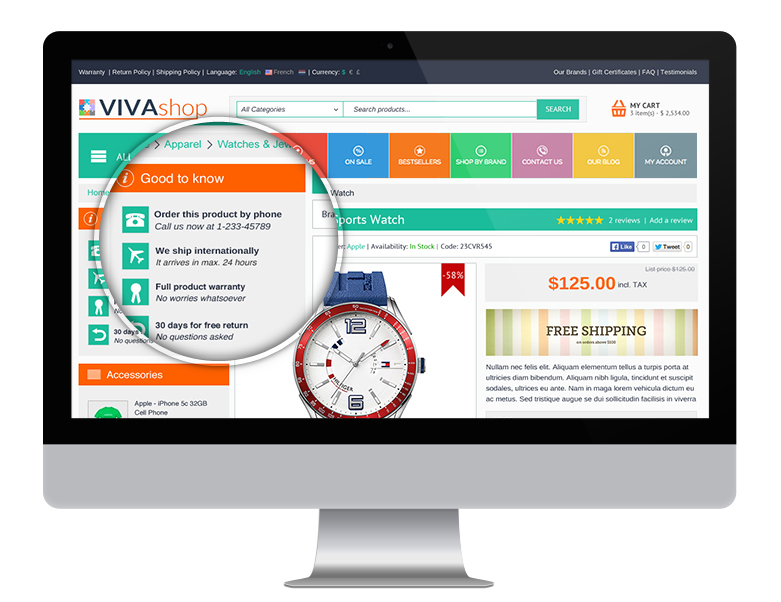 In the future, because the issue may be on your side, we recommend you to take the time to read and get informed, as well as think twice before you add a poor review on a top rated product like VIVAshop, which revolutionized a marketplace and is known by everybody, especially when those developers offer top-notch support services and help you all the time (many times free of charge) investigating your issues generated by incorrect/incompatible third party add-ons/modifications, and specifically inform you what your issues are exactly. For sure that those developers used their experience gained in years of hard work, and dedicated a lot of their time (even spare time), money, effort, and more importantly, passion, to help you by offering best support services on the Marketplace, as well as build a TOP product (not a poor quality one), a product designed to save a lot of your time and a lot of your money. We can only hope you’ll follow our advice before you unfairly damage with no reason the reputation of other developers’ products for which those developers have used their years of experience, and in which they invested their hard work, time, money, effort and passion. Firstly, each theme or add-on developed by any developer here is built and designed to work with the default CS-Cart and Multi-Vendor software, as well as with the default add-ons that come with CS-Cart and Multi-Vendor. Therefore, no developer will ever be able to guarantee you compatibility of their add-ons/themes with all of the third party themes/add-ons on the Marketplace. Nor any developer here will be able to guarantee compatibility with any third party changes that you bring to their products. That is simply impossible. As we speak, there are currently 392 third party themes on the CS-Cart Marketplace here alone, and 1,440 third party add-ons, built by several developers. For a developer to make 1 (one) of their add-ons compatible with 1 (one) third party theme (developed by other developer), the add-on developer needs to read the third party theme code, understand it’s structure and the way it was built, integrate the add-on by coding it, then test it, fix any issues that might come up, then test it again. This may take a few days for very simple add-ons that do not do too much, for other add-ons it may take weeks, and even months for some add-ons. Considering that all developers are firstly interested to develop and improve their own products rather than building compatibility of third party products with their own products, the time to build such compatibility depends on the add-on and third party theme complexity. Let’s say it only takes an average of 1 week (5 business days) to make an add-on compatible with a third party theme. Therefore, it will take a cumulated time of around 7.5 years to make ONE add-on compatible with all themes on the CS-Cart Marketplace here only, on an average of 5 working days per add-on, not considering other themes from other websites, or other themes that will be released in the future on CS-Cart Marketplace here or on any other marketplace/website. Now, if a developer has 100 add-ons, then to make all of their add-ons compatible with 392 themes would take: 7.5 years/add-on X 100 add-ons = 750 YEARS. We do not believe we need continue to do the math and see how much time it would take to make all 1,440 add-ons compatible with all 392 themes on the CS-Cart Marketplace here. It’s the same analogy when it comes to making one theme compatible with all 1,404 add-ons available on the CS-Cart Marketplace. So, for a developer to make their add-ons compatible with all of the third party themes (and vice versa) is absolutely impossible. Besides this, it makes no business sense to allocate the business time towards building compatibility with add-ons or themes which are not used by anybody or are used by very few people. Therefore, as a conclusion, a theme cannot possibly be compatible with all third party add-ons on the Marketplace. 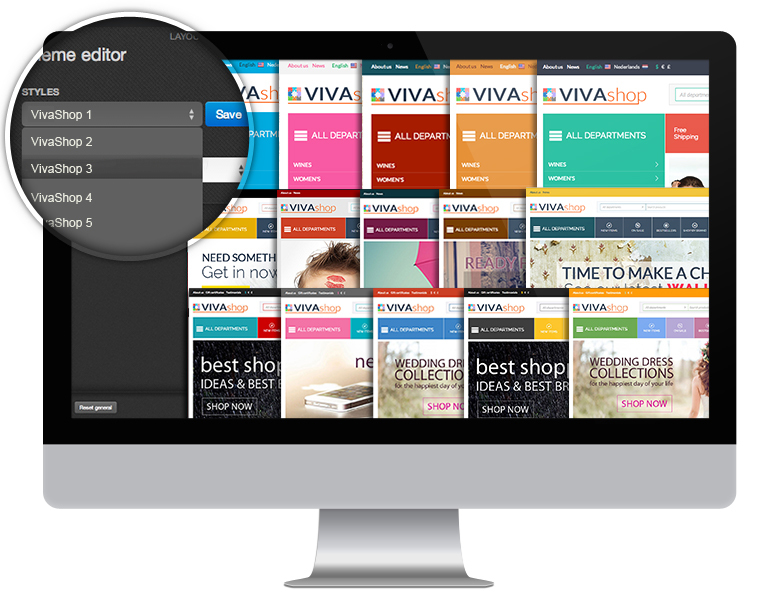 Developers can only decide to make a few of their add-ons (like for example their most popular ones) compatible with very popular third party themes (like VIVAshop), simply because many of their add-on customers also use that respective themes. The theme comes with several already built-in customization options described on the theme presentation page, as well as in the documentation guide that the theme comes with. Other than these already built-in customization options, we cannot possibly guarantee any compatibility with any other custom changes you bring to the theme and which affect the theme, nor with any additional code which changes or affects the theme functionality. That is your own responsibility and it strictly depends on your knowledge, abilities, experience, etc… No developer can possibly guarantee compatibility with third party custom modifications. Also, no developer can possibly anticipate what customizations you will make to the theme in the future. That is simply impossible, and those custom changes depend on you ONLY. That is why, like it is clearly stated under our Terms and Conditions that you have agreed with before, during and after your purchase, we are in no way, shape or form responsible for any incompatible third party add-ons you install on your website, or third party customizations which are affecting your website, simply because those third party add-ons/third party customizations were not developed by us, so we cannot possibly guarantee anything concerning them. Therefore, we have provided you with a product which has been designed, advertised and guaranteed to be fully compatible only with the CS-Cart and Multi-Vendor platforms and as well as with all the default add-ons that CS-Cart and Multi-Vendor come with. It is your sole responsibility regarding any other third party add-ons you install, or any third party custom modifications you bring to our product. In conclusion, this is not a review given to our product, it is a review given to the third party add-ons and to the third party custom theme modifications you have made, which are not fully compatible and have not originally been designed to work with our product. Therefore, you have received our products and services in accordance to all of our Terms and descriptions (which can be proven any given time), and therefore this review does NOT reflect the quality of our product. 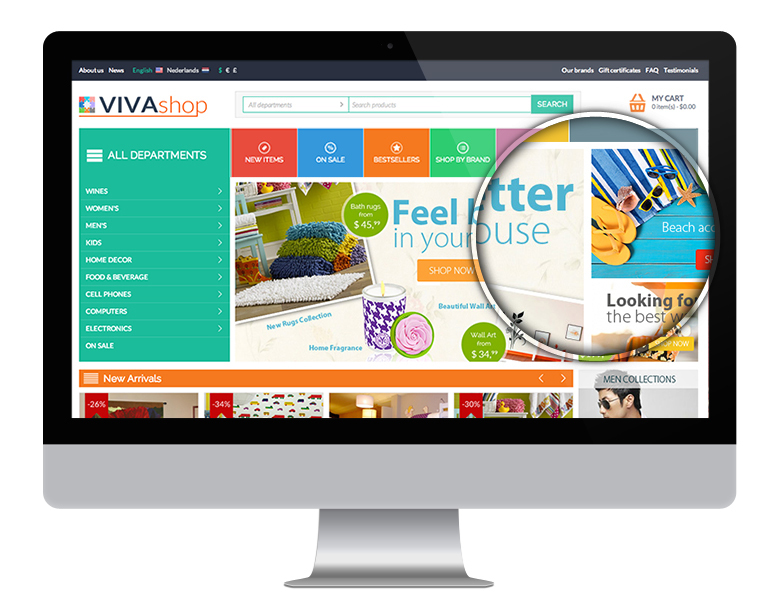 At any rate, with or without your false statement, we know for a fact that we’ll still provide the same top-notch services that we our customers have already got used to, and our existing and future customers will continue to purchase the theme that raised the standards on the CS-Cart Marketplace - the most popular and top rated theme respectively, VIVAshop. We have a lot problem. 90% of add-on is not compatible whit this template. Also performance down on home page for many query call to dB. Good easy to use theme with a lot of flexability. Very good and quick to respond support team as well! 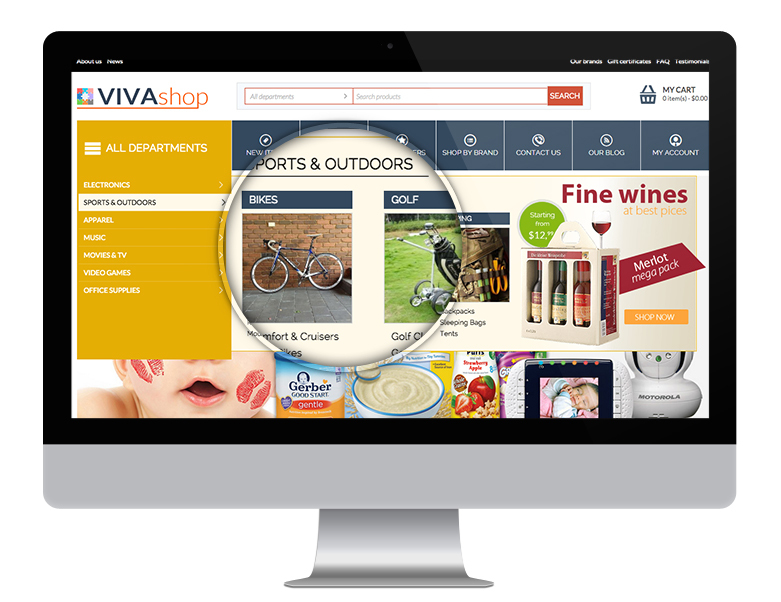 The VIVAshop theme provides many features to give your CS-Cart store front a professional look. Most importantly, the theme is updated with releases of CS-Cart. The support is quick to respond, friendly, and very knowledgeable. The theme is very nice and eye-catching. Moreover, their customer support service is very good and fast. Love this Team. Awsome theme! So much possibilities, so much features, so easy to handle and nice looking theme on a desktop and responsive mobile version too. Theme is 5/5 star rating but their kind support is even more better. Any problem with theme, Energo support deals it immediatly! We are using VivaShop theme from 6 month. The theme is always upgraded for every new version of CS-Cart. We had some problem during upgrade to latest version, and we received an excelent suport and upgrade very speed. 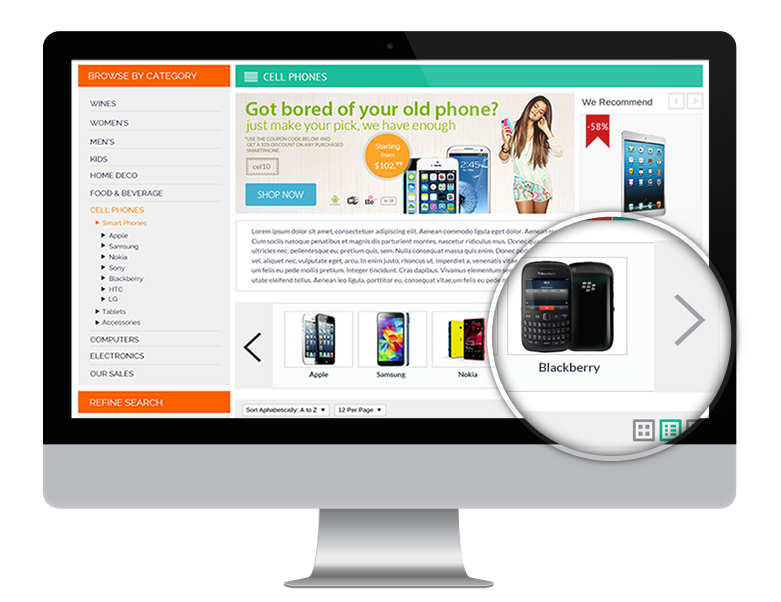 I recommend energotheme services.